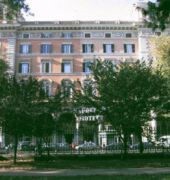 The Hotel Napoleon is a family-run 4 star hotel in Rome center. Charming and very quiet, the hotel is ideal for both family holidays and business trips. The Hotel was built inside of a Nineteenth Century palace, in front of Piazza Vittorio Gardens, less than 1 km from Colosseum and Roman Forum, from Basilicas of San Giovanni and Santa Maria Maggiore and the main train station (Termini). The entrance to the underground is just a few meters away, enabling guests to easily complete their tour of Rome - visiting the Spanish Steps, the Vatican City and many other sights and museums. 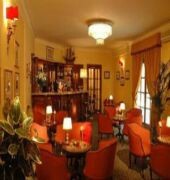 The spacious and comfortable lounges, enriched with precious antique furnishings and soft fabrics, offers a pleasant and relaxing atmosphere. There are also Internet and Wi-Fi area (both without charge). All the rooms face on to internal large courtyards, far away from the noise of Rome's traffic, guaranteeing peace and quiet, unusual for such a busy city. The Napoleon is a Tourist hotel. Located in Termini Railway Station area. Shopping is within walking distance and the nightlife/restaurants are located in the hotel. 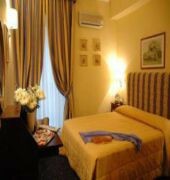 Descriptionclass="small" style="text-align: justify; font-size:11px;">The Hotel Napoleon is a family-run 4 star hotel in Rome center. Charming and very quiet, the hotel is ideal for both family holidays and business trips. The Hotel was built inside of a Nineteenth Century palace, in front of Piazza Vittorio Gardens, less than 1 km from Colosseum and Roman Forum, from Basilicas of San Giovanni and Santa Maria Maggiore and the main train station (Termini). The entrance to the underground is just a few meters away, enabling guests to easily complete their tour of Rome - visiting the Spanish Steps, the Vatican City and many other sights and museums. The spacious and comfortable lounges, enriched with precious antique furnishings and soft fabrics, offers a pleasant and relaxing atmosphere. There are also Internet and Wi-Fi area (both without charge). All the rooms face on to internal large courtyards, far away from the noise of Rome's traffic, guaranteeing peace and quiet, unusual for such a busy city. Yuck yuck yuck! Donâ€™t stay here! I can not get over how bad this accomodation was! The room smelt very strongly of cigerettes and the room was old and outdated with cracks, chipped paint and scuffs in the walls. Some of the staff were friendly and some of them were completely rude! This hotel isnâ€™t close to the station and if you were looking for one close to the station I would advise â€œHotel Rexâ€. Hotel Rex is right next to the train station for ease of access but then comes the railway noise. Napoleon hotel had loud thumping music playing from someone from another floor until late in which kept me awake for hours. The only renovated part of the hotel was the lobby. The room came with a spacious bathroom but had crack and mould, and aswell smelt very strongly of ciggerettes. The wifi was slow and kept dropping out. The room has a sign on the back of the door showing it to be 4 stars! One of the big factors affecting this is the stench of cigarettes! I mean? Who wants to smell strong cigerettes when they sleep? Just a few improvement needed! I stayed at Hotel Napoleon for one night with the family and we were all positively impressed by everyone taking care of guests. Small but clean rooms. I only underline a negative point which is the bad quality of doors. 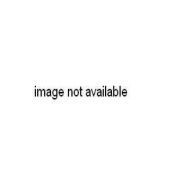 You can not open them! we chose this hotel because of its location, only a 10 minute walk to the beautiful walled town of Lucca, but mainly because car parking was available. The staff were friendly & helpful, providing information about Lucca. The room was clean & comfortable & there was a fridge with water provided but no tea making facilities. the breakfast was alright with a reasonable selection to chose from. For the two nights we stayed we were happy with the accommodation provided. We booked this for its location. Really close to the walls of Lucca. Also needed parking, which it has. Has a bar, though you have to ask the desk for service. Check out the glass size for processo! Rooms are tiny with hardly any storage. Bathroom no where to put stuff. Bed was really hard, the most uncomfortable one I've slept in since our 2 weeks of touring Italy! Clean and basic hotel. Rooms are a bit old fashioned but clean. Location is about 15 min walk from Lucca center. Breakfast was fine. The staff friendly. A basic hotel ideal for a short stopover in Lucca when you are on transit.